St Francis Leprosy Guild (known until the 1960s as St Francis Leper Guild) was founded on 23 October 1895 by a group of lay people in London. Saint Damien, who had worked for years among leprosy sufferers at Molokai in Hawaii, had recently died and his fame had spread around the world arousing considerable concern about leprosy, for which at that time there was no known cure. Kate Marsden, the moving spirit behind the Guild’s foundation, had witnessed the horrors of leprosy while a nurse during the Turko-Russian war in the 1870s. In 1890 she obtained the patronage of Queen Victoria, Princess Alexandra and the Empress of Russia (and a blessing from Florence Nightingale), and set off for Yakutia, the far north eastern region of Siberia in search of a herb reputed to cure leprosy, and to see how best to help the people affected by leprosy known to be scattered in that vast forest area. On her return to England she wrote a book ‘On Sledge and Horseback to Outcast Siberian Lepers’ and lectured in England and the United States to publicise the plight of leprosy sufferers and to raise funds. She was elected a Fellow of the Royal Geographical Society; converted to Catholicism; became a Franciscan Tertiary; and was the moving spirit in the founding of St Francis Leprosy Guild in 1895. A meditation on our patron Saint by the Very Rev. Father Michael Copps, OFM, Spiritual Director of the Guild - Read more. Moscow 1892. 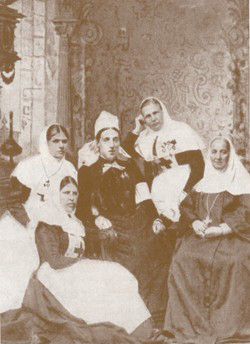 The Princess Schachovksy with three nursing sisters from her institution who are about to leave for Yakutsk. Miss Marsden is seated in the centre of the picture. Part of a letter of introduction from Queen Victoria expressing her support for Miss Marsden.